Another Huge Release: Full Width Layout + Another Big Announcement Coming Very Soon! 1. New "Liquid" full-width site layout. We are extremely proud to offer a new, full-browser-width experience for all sites on the network - think iTunes on this one. Users with nice, big widescreen monitors will be able to view your site in a full-screen mode that adapts to and optimizes for all screen resolutions. To enable the new "liquid layout" on your site, simply to go your Appearance editor under Edit Site Settings in your Admin Panel and you can enable this new option as your default site view for all users. To preview your site in the new liquid layout mode, go to your main tracks page and hit "shift + alt + L" on your keyboard. You can toggle between the two views with this keyboard command to determine if you'd like to adopt this new optimized layout across your site. 2. Drag & drop playlist and cue sheet management. You'll notice that as you navigate your site and scroll down the page your playlists module to the left will never scroll out of view. We did this in order to support our new drag & drop playlist and cue sheet management feature. You can now click on tracks and drag them into your playlists and cue sheets. You can also select more than one track at a time and drag batches of tracks at once into playlists. Albums work in the same way as well. This is really going to speed up playlist & cue sheet management and we're excited to make it available to you now! Check out how it works in the short video below (go full screen, it's way better than viewing this in its native size). 3. Multiple track selection & download capability. Tracks can now be selected by clicking on any empty space around the text in a single line listing. You can also select more than one track at a time by holding down 'shift' or 'ctrl' (PC)/'command' (Mac). Once you start selecting tracks you'll notice a "Download Selected" button appear on the bottom left. This new feature allows you and your users to quickly select and download multiple tracks at once without having to create a playlist or download one at a time. You can also see this feature in action in the video above. Stay tuned...there are some more very big announcements coming right around the corner! The first one is called "Sonic Search" and it's going to be awesome!! 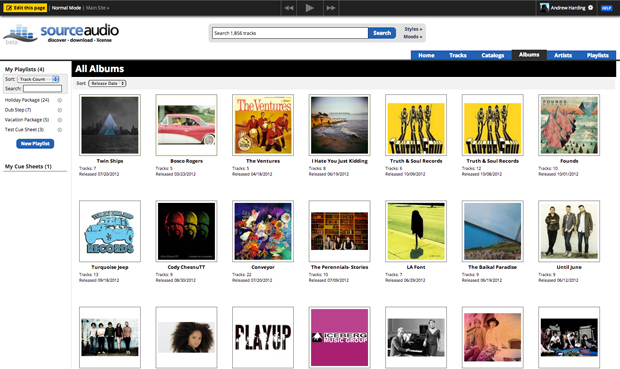 « SourceAudio Launches Sonic Search – The Music Search Revolution Has Begun!